I love it when I get to try a restaurant that's been on my To Do List. Even better is when it turns out well. On Wednesday we went to Bridges on the River. Dean had one of the half-price deal coupons so that we had a $50 gift certificate. We had been to the gym and so we were out for a late dinner. We arrived at the restaurant at about 8:15 and could see it was slowing down. It took a while for us to find a host to seat us. Turns out they finish at 8:00, but they happily seated us and even seated another couple after us. The restaurant is definitely lovely. It sits on the river right by the I-80 overcrossing, thus the name. 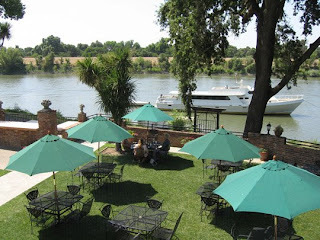 There is a lot of seating outside on the terraces and an area for outdoor buffets on special occasions and for bands. In fact, on Sundays they do feature bands and drink specials. The building has a bar area close to where the band plays on the patio. Then there is a second floor with a large dining area in sections with plenty of window seating looking over the terrace and river. Because it was karaoke night we opted for the upstairs seating, out of range. Our server was very nice and encouraged us to try the bread. They bake it themselves and he was proud of it. Boy, was it good! It's not a crusty bread, rather a medium loaf, super soft, warm and sweet. The special was highly recommended and rightly so. 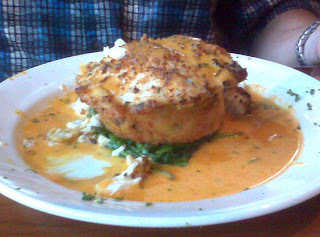 It was a sea bass crusted in panko crumbs on top of a potato cake and spinach with a paprika butter sauce. It was divine! I wanted something different. I also can be leery of fish, even though I know I should order it, because I hate it when it is disappointing. Wish I had ordered the special. Anyway, I ordered the Asian skirt steak with mashed potatoes. It is on the small plate menu. The flavoring and portions were good, but the steak was tough. It was especially tough and they just did a terrible job cutting it on the bias. So my jaw got a workout. Also, even though it was well flavored, it had no extra sauce or glaze. It was just the cuts of steak on top of a mound of mashed potatoes. The dessert menu was very limited, but again the server was very proud of their creme brulee, which is a favorite of mine. Since we hadn't reached our $50 limit, we ordered one. It was good, but not exceptional, like the waiter implied. The waiter took our bill and was very cool about coming back and noting we were still only at $45 and he just wanted to let us know that the extra $5 would not be allowed for the tax and tip. Did we want anything else? Dean asked for a slice of key lime pie to-go. We liked the honesty so that we got our money's worth. I look forward to going again, perhaps for a Sunday brunch or for the Sunday afternoon band.